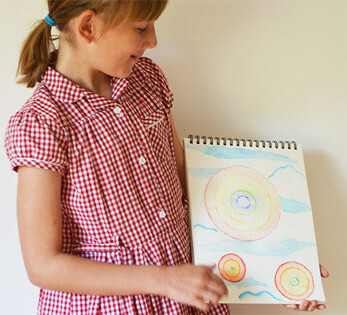 Does your child love drawing, colouring or painting? But need a boost in maths? Are you confused about how best to help them? Get involved at Quangle – discover the power of creativity and the beauty of maths. Quangle is a fun, original and unique approach to learning! Quangle workshops are individually challenging with engaging activities to promote learning – in maths AND art. Your child will be encouraged to find their imagination, creativity and quirkiness – while learning at the same time! Quangle is maths tutoring with a twist! A dedicated teacher, with many years of practical experience, will tailor the learning to suit your child. 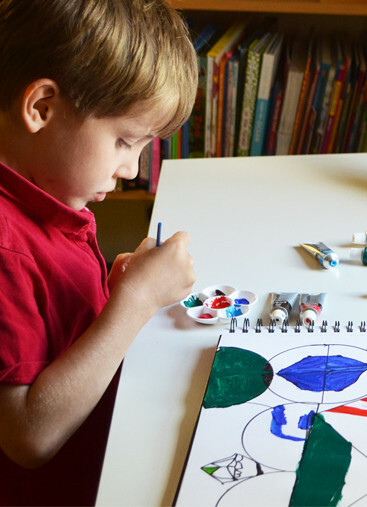 Studies have shown that ART is a powerful 'tool' for learning. Paying attention to pattern, looking at shapes from different angles and creating images in our minds helps us to understand and remember what we see. "Using art to teach maths, using maths to teach art. Denise has combined two areas of expertise to provide an engaging way to challenge and enhance both maths and drawing skills for all abilities." Mrs Gardiner, KS2 and Maths Co-ordinator. Develop accuracy in creating a variety of shapes with a variety of materials. Discover and discuss concepts of maths through the pleasure of creating. Explore similarities, differences and make connections in maths. 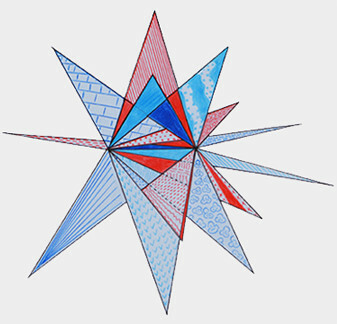 Produce original designs reflecting the beauty of maths. Quangle provides a simple solution to help your child advance their knowledge and understanding of complicated maths vocabulary and concepts. Workshop sessions last for a whole hour. Parents are then actively encouraged to attend for an additional 15 minutes – please come along if you can - to share in your child’s learning. This will enable you to continue your support away from the sessions. 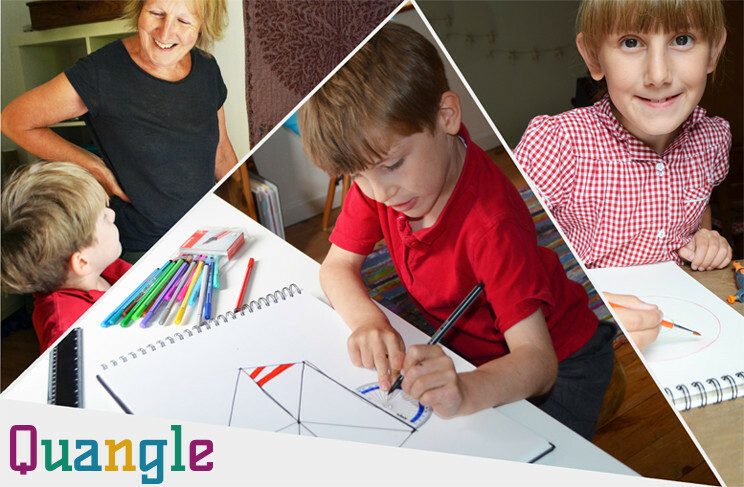 Quangle is a workshop in which children can learn and grow in art and mathematics, with support from an experienced teacher and from you! Suitable for all children in KS2 (age 7 to 11). Workshops are usually held as after-school sessions in blocks of 5 weeks. Look out for details of a FREE taster workshop session in your school. Numbers are limited and booking is essential (groups are kept small for more individual attention). Workshops will be advertised at your child's school. You can also Check Facebook for dates, session times and cost. Return your completed booking slip with cash or cheque to school. You can click here to download a booking form. Sorry, NO REFUNDS given for missed sessions. Please state any relevant medical information or allergies when booking. All sessions are led by a qualified teacher and activities are aligned to the national curriculum. Contact Denise today to find out more and book a session for your child.